The Ducati Hypermotard is the bike especially for the strong. If we analyze the motorcycle market will not find two representatives with soul of a true supermotard. Some may think of the MV Agusta Rivale or even the Yamaha MT-09 as potential competitors to the Hypermotard, as they bring cubic capacity and similar power. However, both do not have the DNA that Ducati Hypermotard brings in its essence. The engine Testastretta 11 °, one bicylinder "L" with 821 cc liquid cooled, delivery 110 horsepower and lots of fun to pilot. Thanks to the complete electronics package (Ducati Safety Pack) that integrates electronic throttle (RBW) with three driving modes, traction control and ABS brakes with different levels of action, who pilots the Hypermotard not stop smiling, is pure adrenaline! The good news for those who like this style is that the price of this exclusivity fell from US$ 14,995, because from the beginning of the year it is being mounted in Manaus (AM). Not that it's a bargain, but who have flown professionally in the on or off road, or even in supermoto category, know that the investment is justified by the uniqueness of the model. No wonder I mentioned professional pilots target audience of this motorcycle. Of course the pros are not the only ones capable of to pilot it, but the Ducati Hypermotard does not accept vacillation. 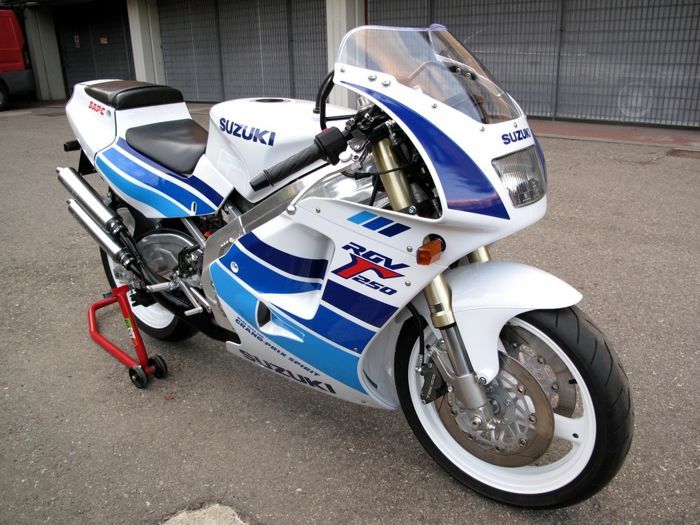 You need years of experience on motorcycles to "play" with mastery and extract what this bike is best. The traction control and ABS help a lot in this task, but with the way "Sport" enabled the pilot receives both torque - 9.1 kgf.ma 7,750 rpm - in the first three gears that any weakness may be punished. For those who like this kind of adrenaline, the Hypermotard is an exception in the market. Before talking about his other predicates, let us understand a bit like all electronic acts. Three pilot models are available and programmed to instantly exchange the torque / power of the engine and ABS intervention levels and Ducati Traction Control even while driving. The mode "Sport" provides 110 hp with a direct response RBW acceleration, reducing the DTC system intervention and level setting 1 (high efficiency braking) ABS. To be honest I rode almost all the time in "Sport". And it is exactly in this configuration that the Hypermotard delivers a different feeling, making the pilot to remember at all times that it is over a legitimate supermoto. Locked curves are devoured with efficiency and outputs with open fist front raises immediately increasing the speed with ease. The riding position is attack, the arms are open, and the feeling is that we are on the front wheel. When the habitat turns the road Ducati Hypermotard shows his dual identity. Change the mode to "Touring" and accelerate with ease. The first major difference is in the throttle response and torque delivered to rider, since the 110 hp are also present in this configuration. That is, just open the throttle the speed grows gradually reached with ease the 200 km / h - no aerodynamic protection to withstand high speeds. In this field what impressed was the stability of Hypemotard, even at high speeds. Motorcycle with long-travel suspension at the front often become unstable in triple-digit speeds. In at least 180 km / h, it was possible to feel the front floor without fluctuations. This makes this biker also perform high-speed corners with skill, revealing all its versatility. The reserve light lit with 289 km on the odometer. The consumption of 17.7 km / l was close to 18.5 km / l that the onboard computer reported on the touch panel, very complete and easy to read. Although simple, shows instantaneous and average fuel consumption; has two odometers, plus a reserve; clock and still the driving mode and the traction control levels (DTC) and ABS. Besides, of course, speedometer and tachometer digital. Another positive aspect of the Ducati Hypermotard is design. Running, it seems to cause the pilot at first glance, as if to say "and so, will face ?!". Moreover, the Hypermotard has changed a lot compared to the old version. The fairings have a more aggressive design with angular forms. The exhaust system, which was double outlet under the seat has been replaced by a single triangular piece on the right side of the bike. 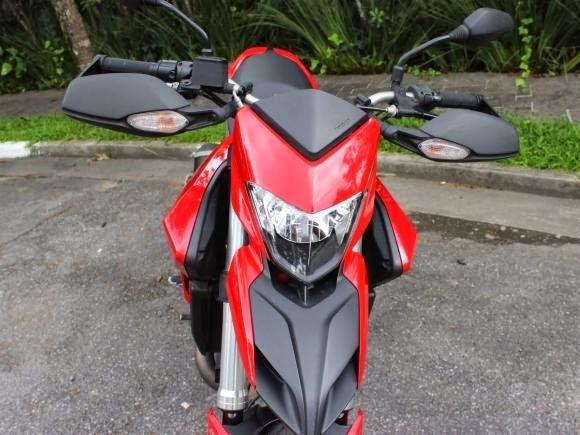 Besides being more beautiful and follow the new lines of the Hypermotard, the new system does not heat the back of the bank as on its predecessor. 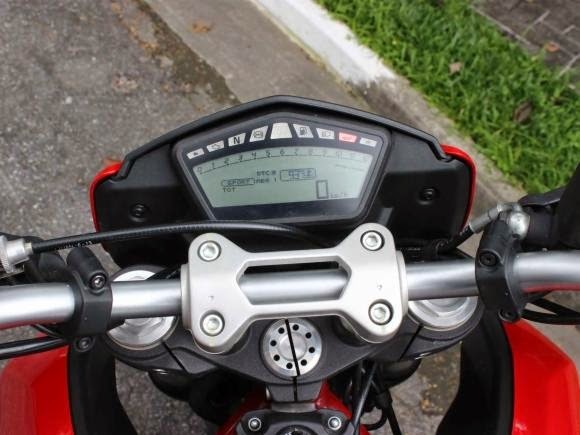 Ducati also changed the rear view mirror of place. Now the pilot can pass the corridor formed between cars and at the same time, have a good rear view. In previous versions, the mirrors were retractable and fixed the handlebar ends, driver choose to open the mirror or not - in the city recommend running the "Urban" mode, where only 75 hp are available to the pilot. The suspension assembly has 43 mm inverted forks and combine well the long haul of 170 mm on the front wheel (17 inch) with performance. Absorb road impacts, but do not compromise sports riding. The characteristic picture lattice fits the part that makes up the subframe and ends at the rear Unit swing, completing the piped style Hypermotard. The clutch also noteworthy. The system has a mechanism with oil immersed disc that helps compress the springs and lighten the clutch lever, helping more abrupt downshifts. At the rear, monamortecedor can be easily adjustable preload to ensure greater rigidity. 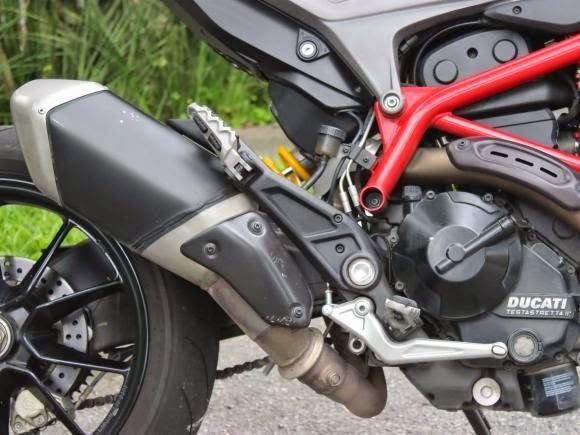 To complete the well hit cycling whole Hypermotard, Ducati did not think twice and adopted two semiflutuantes discs 320 mm with Brembo calipers radially mounted 4-piston and at the front. And a single disc of 245 mm and 2-piston caliper at the rear. Besides sufficient to curb Hypemortard, they also require pilot's skill, since the radial brake pump urges caution: just triscar finger on throttle forward and download your eye popping. 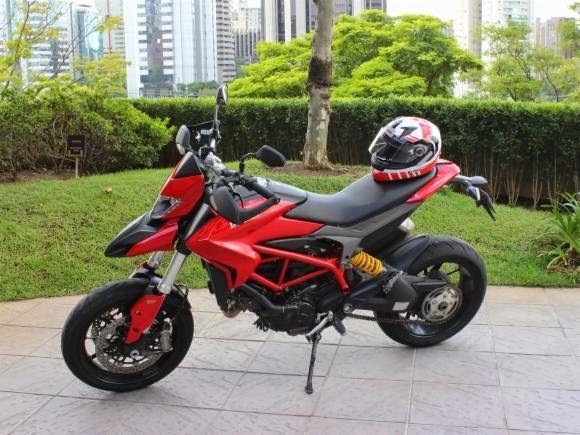 Buy a Ducati Hypermotard is not a rational choice. If you start thinking too much and to reckon putting face to face practical and radical, will probably choose a bike that, even cheaper, will go further. Now, I have full conviction that to a former pilot, is of motorcycling, motocross or for those who already had other biker style bikes, the Hypermotard is worth every penny for the amount of pleasure it offers. 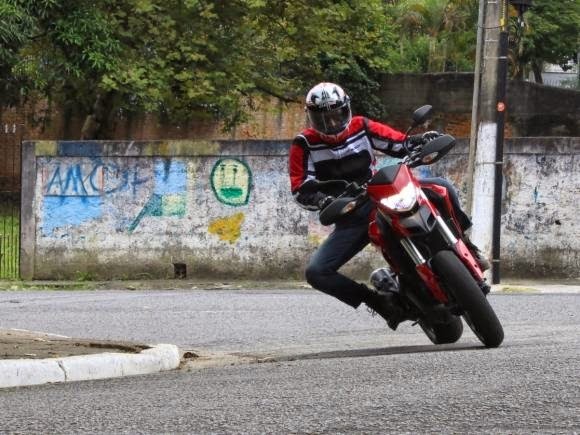 Recalling that the Ducati nationalized the standard version (tested) and the Hyperstrada (with side bags, high handlebars, windshield and more comfortable seat). 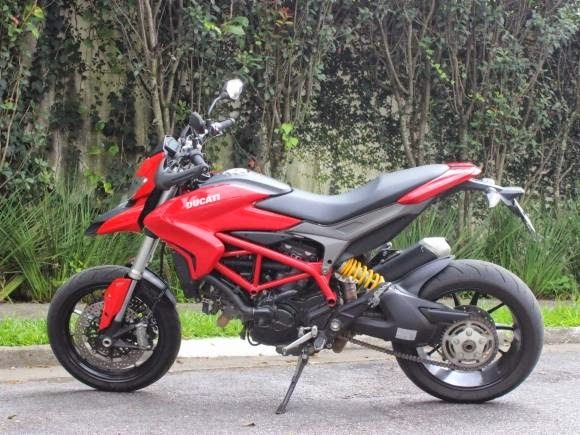 Already the Hypermotard SP version (Marchesini forged wheels, racing tires Pirelli SUPERCORSA SP, Marzocchi suspension fork 50 mm Öhlins damper) will no longer be imported by Ducati Brazil. The colors are red and the standard red or white with gray frame in Hyperstrada.